Still Remembering Lynda Lee Kaid – so this is mass communication? Tomorrow, April 13, is the one year anniversary of the gone-too-soon Dr. Lynda Lee Kaid. Dr. Kaid (yes, I still call her Dr. Kaid even though I’m a tenured professor!) was my mentor, adviser, support system, cheerleader & friend during my doctoral studies. It has been very difficult for me to mourn her, because the day that I found out she had passed I was getting on a plane to Afghanistan for my military recall. As you can imagine, the real world is suspended when you’re at war. 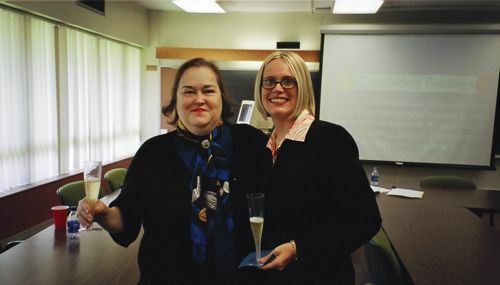 Sadly, I missed the opportunity to celebrate her life and contributions to this world at the fantastic memorial service (video here) at the University of Florida. Dr. Kaid’s research, approach to learning and presence is always with me. She created a true research family of her graduated students that made up a rich international network. Some of my favorite people and the brightest minds in political communication scholarship were taught the ropes by her and it shows. 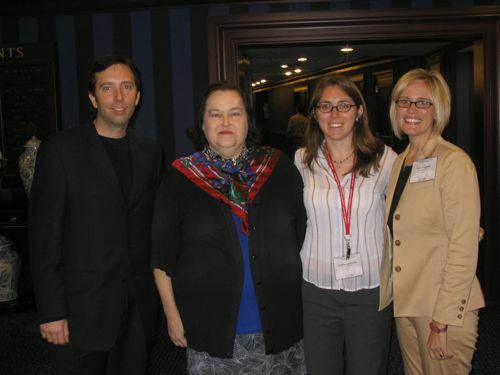 Dr. Andrew Paul Williams, Dr. Lynda Lee Kaid, Dr. Kristen Landreville & Dr. Kaye Sweetser catch up at ICA 2005. Beyond those public & scholarly contributions, I have countless memories of election returns parties at her house, movie screenings, late night pizza & data sessions, jury rigging cable in the journalism college for a debate experiment & fancy dinners at conferences. Dr. Kaid was simply one-of-a-kind. She believed that you learn by doing. Jump into a research team & just start — there is enough for everyone to have a meaningful contribution. She believed in sharing knowledge. No need to keep your projects secret, rather invite in more scholars for a richer collaboration because there is always data enough for everyone. She believed in working hard. Because of her I can manage multiple (upwards of half a dozen) projects at one time. Not only that, I remember that she edited my last draft of my dissertation only one day out of surgery. Her edits were thoughtful, complete and supportive while pushing me to make the research better. She believed in being productive. People ask me how I publish so much scholarship annually & my answer is always “doesn’t everybody?” — I followed Dr. Kaid’s impressive lead as closely as I could keep up. Most importantly, she really believed … as in she believed in me. One of my favorite stories about Dr. Kaid is one I didn’t come to really know until after I’d graduated with my PhD. I’ll start at the beginning. When I started my doctoral program at UF, it is no surprise to the people who know me that I had a very aggressive plan for accomplishing my goal. Not only did I want to finish in about 2 years (not impossible since I was just rolling out of a master’s program at the same school), but I also wanted to research a communication tool that was new and mostly made fun of at the time (blogs). I remember asking Dr. Kaid to be my dissertation chair, much like one asks a date to the prom. Though I had worked on her research team at that point for several months, I was not officially her student nor was my area officially political communication. (I had just been on the team for fun.) I talked to my friends about it, created a strategy for the discussion and even role-played. I was nervous for nothing because she signed on immediately. Not only did she agree to formally be my mentor, she agreed to allow me to develop my first-choice dissertation topic: celebrity blogs. At the time this was not en vogue, nor did it seem like a scholarly topic at all. I later learned that her own adviser, another scholarly great (Dr. Keith Sanders), had extended her the same support in that when she asked to study political advertising for her dissertation most at the time said that topic was not going anywhere. She took a chance on me, just like Dr. Sanders took a chance on her. There is so much to say, so many things to thank her for and so many accomplishments that me and my 40 Kaid-advised research “brothers and sisters” have all thanks to her mentorship. As I mourn her loss a full year later, I’ll spend tomorrow in the way she most would want: in a political communication research team meeting on campus. Rest in peace to one of the greatest scholars and all-around-most supportive and wonderful people of all time. Thank you for this lovely tribute. I have really been missing Lynda, and this was just what I needed today. I came across this while googling “Kaid.” And want to thank you for the beautiful rememberence of my Aunt. She truly was one of a kind and is greatly missed. May I share the article with family?